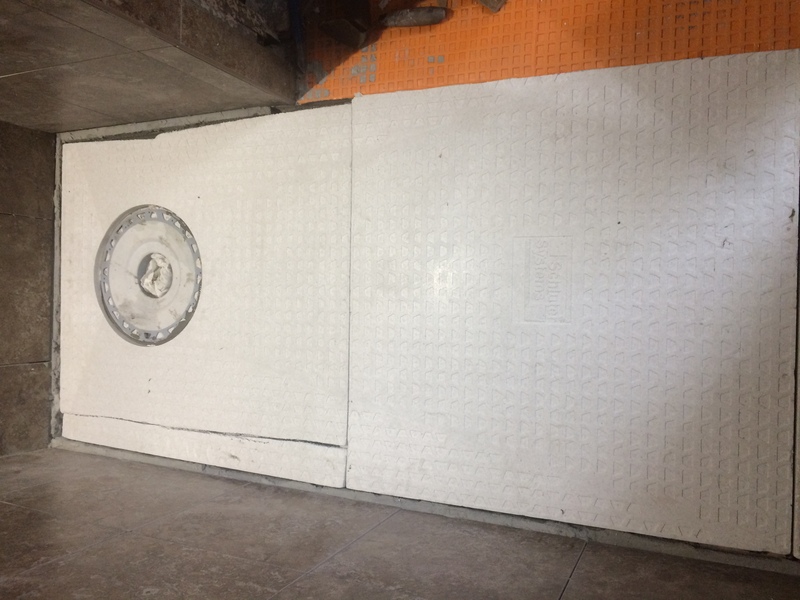 The Kerdi shower floor is made of sloped pieces of EPS styrofoam that are fitted and mortared to the floor with a non-modified mortar. I had to trim the pieces of shower floor to fit my shower. 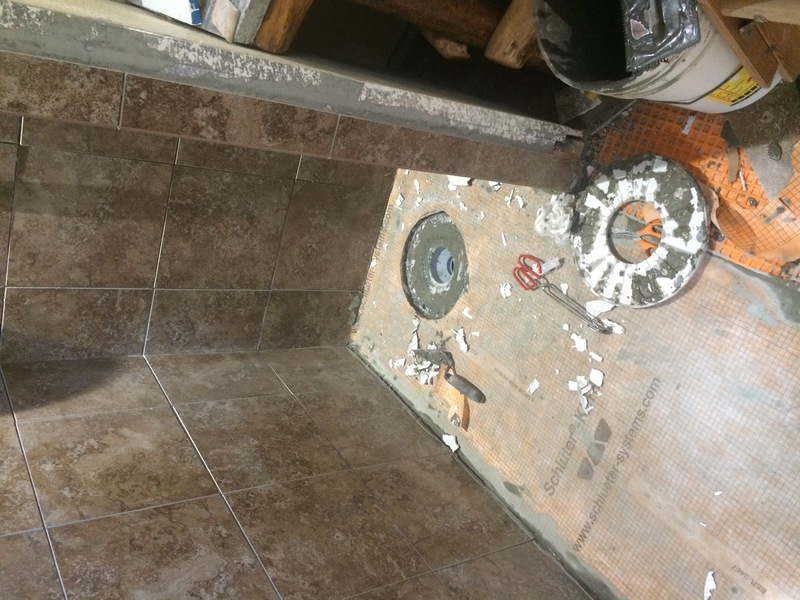 The floor pieces are 32 inches wide and this shower is about 30 inches wide. I purchased the floor that sloped to one side for an offset shower drain. This is similar to a typical tub to shower installation except that mine is longer. The area is 73″ long to the shower bench. Unfortunately I cut the wrong end off of the shower drain piece and had to move it over, cut again and piece in the other side. 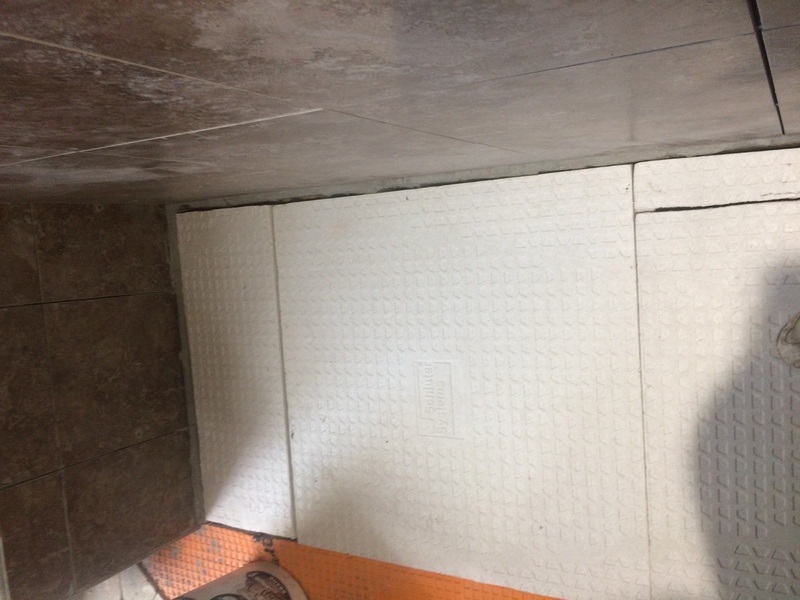 I also added a piece of Kerdi floor that we did not use in the smaller shower in the master bath to fill the extra foot or so near the bench. I started cutting with a plain handsaw and I ended up with a crooked edge. Afterwards I used the multitool which cut the Kerdi straight and easily. I used the trim to fill in the side gaps. Although the directions do not call for it, because of the ragged cuts, I caulked the edges with Kerdi-Fix. The extra piece was slightly higher than the rear of the larger Kerdi piece. Not sure why because it should have been higher only at the edge and sloping from there, And the edge of the 60 inch piece should have the the high point But the side I had to trim was on the extra piece. I lifted one piece to be sure the mortar had even coverage as recommended. Walking on the base a bit helps it to settle in place on the mortar. The system allows the application of the waterproofing membrane right after the floor is mortared in. I used a fresh piece of membrane instead of the piece that came with the shower base so that it would not have a seam. I have quite a bit left on the roll that I purchased. The shower is a little narrower at the drain end where the wall is located and I just cut about an inch away from the drain side of the piece to fit it around the wall. I used the same mortar to place the membrane. But I had a problem at the drain end. 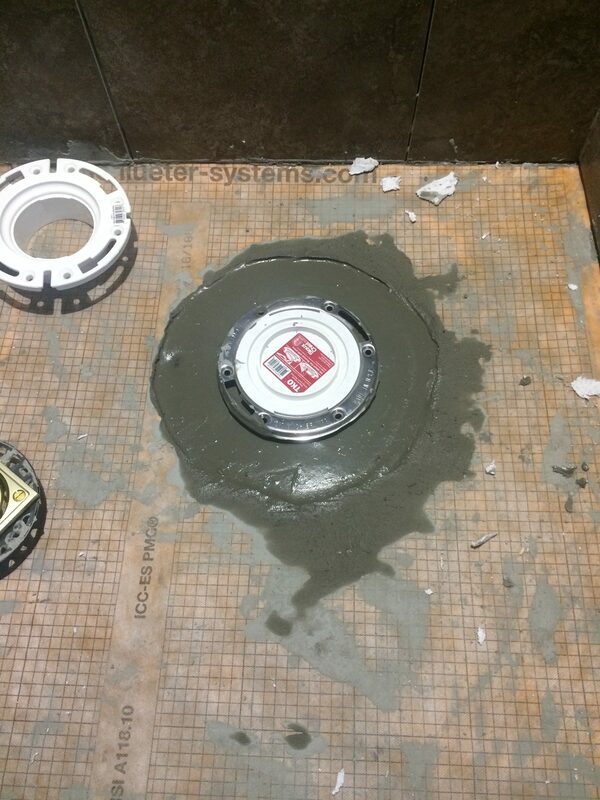 I cut away the entire drain cover of membrane to fix the gap created around the drain. I installed the drain way before the I put in the leveling cement. So the drain was recessed too far into the Kerdi base. I tried to mortar the extra base piece that goes under the drain on top of the original to raise the drain. I spent a lot of time trying to trim the piece to the exact level that was needed. I could not get the mortar to hold the piece firmly so I gave up and decided to find a piece of pipe to keep the drain open while I filled in the gap with mortar. I had a couple of extra toilet bases and the one with the metal rim sat higher in the hole. So I used it and poured some mortar around the pipe. I spent a lot of time trying to smooth out the membrane. Including lifting the membrane to carve away the lip that the back portion of the floor had. I used a multitool to shave off the styrofoam to meet the piece next to it. The idea is that all water should run down the base to the drain. The membrane tended to be lumpy where the mortar was a bit uneven. I applied the mortar with a V notched trowel and I was surprised I had so much work to smooth out the membrane. I thought I spread the mortar evenly before I put the membrane on. But smoothing it out was still time-consuming. The mortar on the floor and membrane have to dry 24 hours and then it will be time to lay the floor tile. This entry was posted in -Chronological Recent Posts, Construction, Tile. Bookmark the permalink.